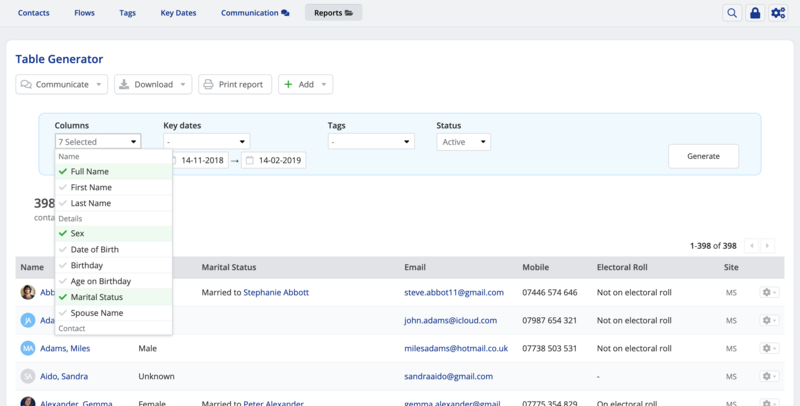 Within the Address Book, Children, Calendar, Small Groups and Giving module's Reports section is a Table Generator that enables you to produce a custom report of just the fields of information you select for contacts, children, events, groups and givers. By default, the table results includes all records from the module with further context-relevant filter options for maximum versatility. The table's results columns are click-sortable enabling you to order the results by a particular column. The report can viewed on screen, printed or downloaded in CSV or PDF file formats. Note: While you can choose which fields to include as columns in the table's results, you cannot change the order of the table's columns across the page. The Address Book module's Table Generator enables you to select contact-related Columns, with further filtering options for Key dates, Tags, and contact Status. 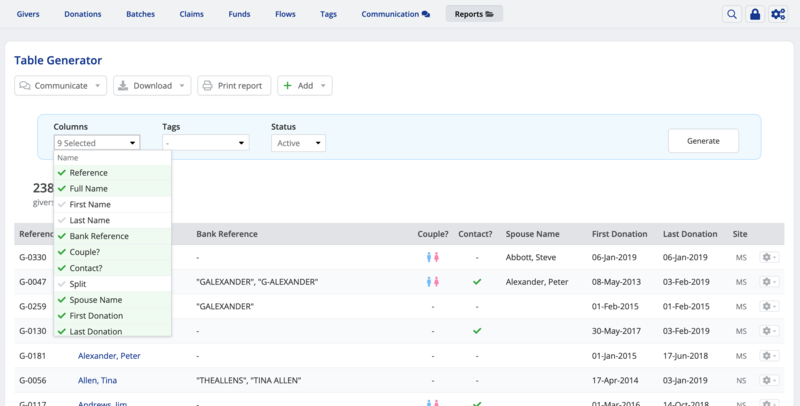 You can add contacts in the table's results to tags and flows, and Communicate directly with contacts or send the report to another person. The Children module's Table Generator enables you to select child-related Columns, with further filtering options for Key dates, Tags, and child Status. 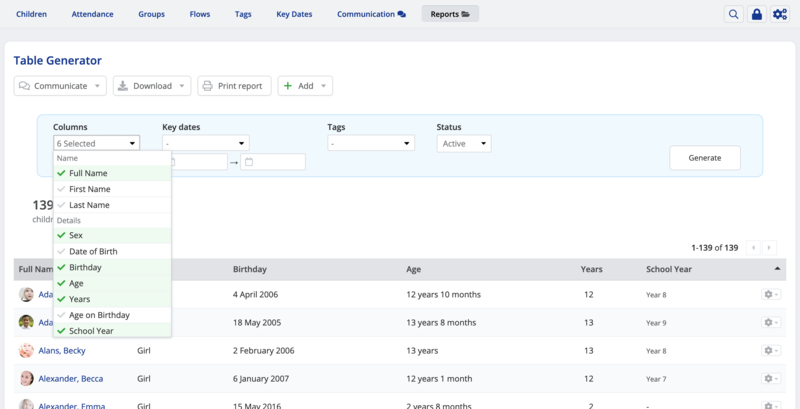 You can add children in the table's results to tags and flows, and Communicate directly with children or their parents, or send the report to another person. The Calendar module's Table Generator enables you to select event-related Columns, with further filtering options for events within a range of Dates and event Categories You can also send the report to another person. The Small Groups module's Table Generator enables you to select group-related Columns, with further filtering options for group active within a range of Dates, Cluster and Group Tags You can also send the report to another person. The Giving module's Table Generator enables you to select giver-related Columns, with further filtering options for giver Tags, and giver Status. You can add givers in the table's results to tags and flows, and Communicate directly with givers or send the report to another person.